We are a leading Manufacturer of spiral coupling, bellow coupling and steel couplings from Mumbai, India. Owing to our extensive years of industry experience and in depth market knowledge, we are providing Spiral Coupling. This spiral coupling is manufactured by inculcating modernized technology in sync with prevailing market norms of quality. Its features include one piece construction made of aluminum alloy or stainless steel material. The offered spiral coupling is widely used to couple tachogenerators & encoders. All rotary precision position Transmitters. Different Diameters & Bore sizes. Higher torsional torque in steel versions. With inserts for electrical / thermal isolation. Our firm has an advanced and sprawling infrastructure which has all the modern and sophisticated facilities to manufacture best in class Bellow Coupling which connects two shafts to transmit torque & motion. The offered bellow coupling is manufactured using high quality of material & modern techniques in fulfillment with the standards of market. This bellow coupling is generally utilized where low pressure fluid transfer is demanded. Hubs available in aluminum alloy, st. steel, brass, nylon material. Inbuilt flange clamping or set screw clamping. Angular offset upto 7 degrees. Parallel offset upto 0.5mm. No backlash. Different Dia & Bore sizes. 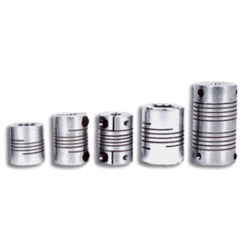 In order to cement our reputation in this domain, we are occupied in offering a wide range of Steel Couplings which are good demand in the market due to high quality and durability. Our coupling is immensely used to couple tachogenerators, encoders and other electronic instruments. 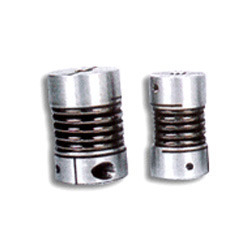 The offered coupling is manufactured with the use of standard quality raw material along with innovative techniques in tandem with industry norms. Customers can avail this coupling at industry leading rates in a confine time. Offset adjustment up to 5 Deg. and parallel up to 0.2 No. Torsionally flexible / stiff - producing constant velocity assuring smooth bearing loads. Precise concentric integral set screw or collet / flange type clamping. Compact - space saving and lightweight with low inertia.